Make fitness, self‐defense, and stress relief a part of your life. 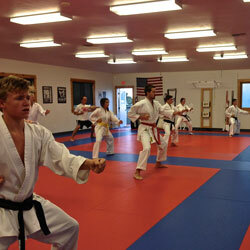 At Bozeman Karate you can achieve total overall fitness. Each class consists of stretching and calisthenics before the karate instruction begins. Learn the fundamentals of Isshinryu Karate while getting physically and mentally fit. Our program allows for each individual to excel at his/her own pace within a non‐competitive format. While our regular Adults Karate class focuses on the teaching of traditional karate and its fundamentals, we offer a separate optional sparring class that is available to students once they have attained the level of Yellow belt. You do not need to be “in shape” to begin. It is our job to get you in shape! Now is the time to take control, get in shape, and learn self-defense. Our Isshinryu karate program is year round, not seasonal, and is full time. Karate is like no other sport . . . you can train for a lifetime!